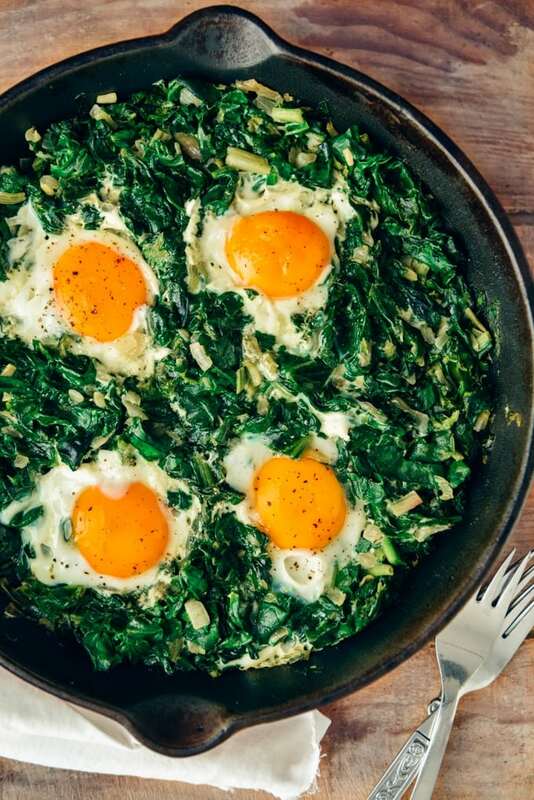 Fried Eggs with Spinach is an easy dish you can make in one pan. It is packed with great flavors and nutritious foods. You need 6 ingredients only. It makes a delicious lunch or dinner that is ready in no time! I am so obsessed with eggs, especially fried and sunny-side up. 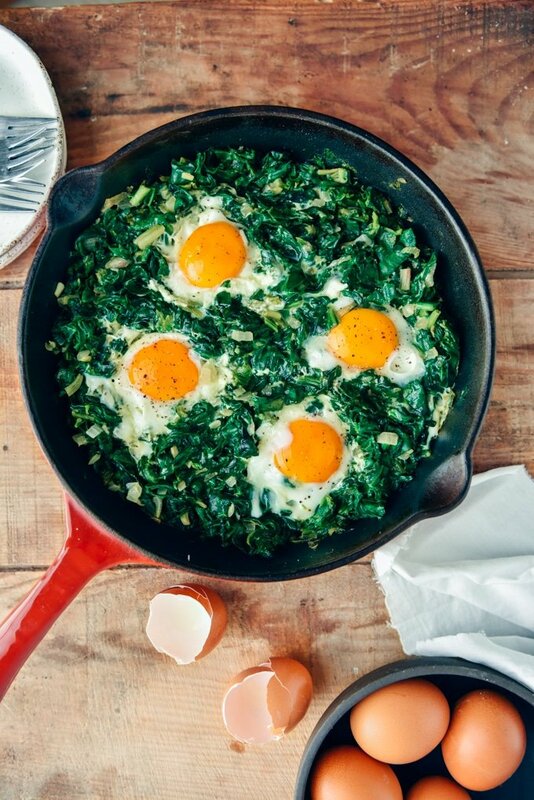 I can crack eggs on any vegetable I cook in a pan and this Fried Eggs with Spinach recipe is one of my favorites. My mouth starts to water once I see that the yolk leaks on the cooked spinach. Watch the video below and see it yourself! Nobody can resist that yolk! YUM! We mostly have this for a busy weeknight dinner, but you can have it for breakfast as well if you need a change on your regular Healthy Banana Pancakes or cereals. This is a super easy recipe that you can make for dinner on weekdays. It is like the green version of our Turkish Egg Dish Menemen. Heat olive oil in a pan, add in onions and cook until transparent. Roughly chop the spinach leaves if they are large, but no need for this if you are using baby spinach leaves. Just add them as they are. You can even find washed and chopped spinach leaves in packages at the market, so use them if you need to be quicker. Cook stirring occasionally until tender and no juice left. Season with salt and black pepper. If your pan is not large enough, put the spinach in batches. Watch how in the video below. Put the first batch, cover the pan and let it cook for about 5 minutes so that the spinach leaves wilt. Then uncover and add the second batch and repeat this if needed until there is no spinach left. Make wells for eggs. You can add as many eggs as you like. Crack one egg into each well and cook until the whites set, about 3-4 minutes. You can gently poke the whites with a wooden spoon to help them cook well. Sprinkle salt and black pepper on each egg. I don’t whisk the eggs before adding them into the pan in this recipe because I love to keep the yolks slightly runny and dip bread right in the center of them. Oh my! Did you see it in the video below? That moment makes me forget everything in the world! If you want, you can whisk eggs first and then pour over the cooked spinach. Make sure you don’t overcook the eggs if you try this version. Remove the pan from the heat after 2-3 minutes when eggs are still a bit loose. Are eggs and spinach healthy? Eggs are one of the healthiest foods packed with protein. Also, they keep you full for a long time, so they make perfect breakfast, lunch and dinner. When you combine eggs with spinach, you have one of the healthiest meals because just like eggs, spinach is a nutrient-dense vegetable. It is a great source of calcium and iron. What’s more, there is no ingredient here that increases the calorie of this recipe. In Turkey, generally people love spinach dishes with yogurt, but experts say that when you eat it with yogurt, the calcium in yogurt and the iron in spinach combine, which causes zero benefit. If you don’t care about vitamins and you are just in search for good taste, go ahead. I sometimes do that as they are perfect pairs, but generally I cook it with eggs and no yogurt is needed that time. 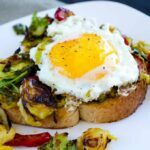 Love eggs as much as I do and want more egg recipes? Check out the following links! A super easy meatless recipe with eggs and spinach. In a large skillet, heat olive oil over medium heat. Add in onions and cook until transparent, about 5 minutes. Add in the spinach and season with salt and black pepper. Cook it stirring gently until the spinach leaves wilt. Make 4 wells in the spinach mixture when it is tender enough. Crack an egg into each well. Cook for 3-4 minutes until the egg whites are set. Sprinkle salt and black pepper on each egg. This post was originally published in 2009 and has been updated with new photos and additional information. Great recipe!! Tried it loved it. Will keep having it! Hi Anne! Glad you loved the recipe! Thanks for the feedback!